When it comes to keyword density in SEO, we’ve seen quite a few major shifts over the years, mainly because of two major factors: Google’s Hummingbird algorithm update, and, RankBrain’s emergence (and direct influence) over the search engine result pages. The latest discovery comes in the form of TF*IDF optimization, which completely redefined what we believed to be optimal keyword ratio and SEO keyword density parameters. 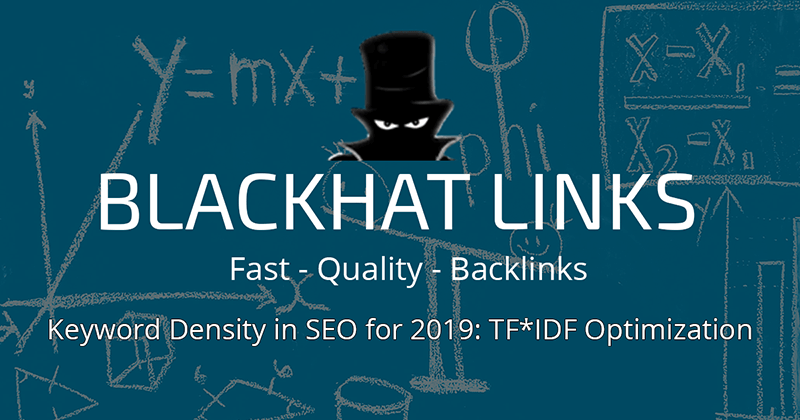 Today, I’m going to fully explain what the TF*IDF formula is all about, why TF*IDF is important for SEO, how it directly relates to keyword density in SEO and finally, how you can begin optimizing your content with TF*IDF using the tools I consider the best at the moment. First, let’s take a look at what TF*IDF is. TF*ID means Term Frequency with Inverse Document Frequency (which is definitely a mouthful) but it’s actually a mathematical formula that was first crafted in the 80s, and it’s used to determine how important a word or phrase is to a document. Term Frequency: it tells you how often a word or specific term is used in a document. Inverse Document Frequency: it tells you how important certain terms are: words that appear a lot have a lower weight, the idea is to assign common terms like “the” and “it’s” a lower importance since they don’t provide direct information on what documents are about. Field Length: self-explanatory, in small fields, such as a title field, specific terms are given bigger scores, whereas terms in a bigger field, such as your (blog post’s body) will have a lower score. There’s a good chance that Google has incorporated this formula (or a modified TF*ID formula) as part of their algorithm’s tools to crawl and understand content. This is also consistent with Google’s efforts to use latent semantic indexing since 2003’s Google Hummingbird update. So, it’s only fair to say, that TF*ID isn’t exactly new, if anything, we’ve been using keyword density in SEO and keyword ratio as a way to oversimplify how this formula works. I’ve avoided including the exact mathematical formula behind TF-ID to keep things as simple as possible, but I’ll drop a link here if you’re interested in how these variables are calculated. TF*IDF heavily ties in with Google’s efforts to improve semantic search, and a properly conducted analysis of your competitor’s TF-IDF (or namely, their keyword ratio and usage in their content) will give you a clear indication of what sort of content and topics you need to include, if you want to offer your prospects a better experience. 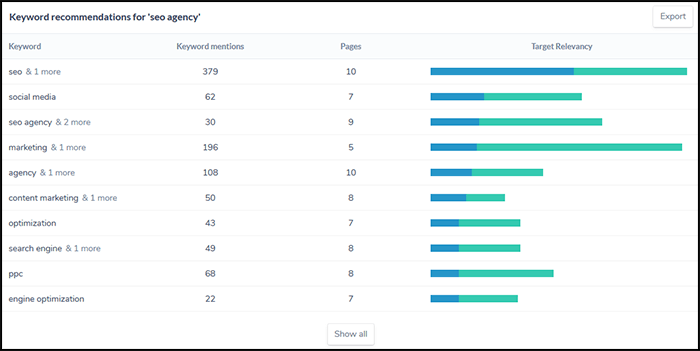 You’ll be able to learn new relevant terms to your queries (or target keywords) that you hadn’t thought about before, and you’ll also fully understand the numbers behind recommended keyword density in SEO. Incorporating new ideas from your TF-IDF analysis will likely help you improve content stuck on the second page of the search engine results page, or even help you rank newer content considerably faster. In short, by implementing TF*IDF optimization in your content, you’ll gather new insight on your customer’s interests, uncover new profitable keywords and improve how well your content ranks in the short and long term. One of the main benefits to TF-IDF Analysis is uncovering new, highly semantic relevant keywords to help your content rank faster, while making sure it tackles all the important topics your audience finds interesting. But how are we going to find all of these keywords? That’s easy. Straight from your competitors. We’ve talked about the importance of analyzing your competitors when you’re doing keyword research for new content, and a TF-IDF analysis will not only let you know the main keywords they’re targeting, you’ll also know their individual weight and relevance score to specific queries in Google. You can get the average word count of a keyword’s top 10 results using Screaming Frog, and then use Ryte’s TF*IDF tool, to run your TF-IDF analysis. Or you can use Website Auditor, press “Content Analysis”, then “TF-IDF in Website Auditor” and start analyzing your target’s keyword top 10 results. When it comes to optimizing your content, you’ll find yourself in two very different positions: either you’ve already published your content with your ideal keyword density in SEO, or you’re about to start creating your content from scratch and want to tackle SEO keyword density meticulously from the start. I’m going to explain how to use the TF-IDF formula on both scenarios, with two different tools, but keep in mind that both of the tools I’m recommending are capable of lending a hand when it comes to keyword density in SEO, whether your content has already been published, or not. Ryte’s tool, in my opinion is incredibly solid, and I’ll be using it to further explain how to optimize a webpage’s SEO keyword density. Let’s say that I’m launching an affiliate marketing site that sells Skincare products. In my list, I might have results such as “skincare”, “vitamin c”, “vitamin c serum”, “guide” and suddenly there’s the name of a famous affiliate marketing site that also sells skincare products, let’s call them “yourbeautyskintoday”. Naturally, we’re not going to promote our direct competitors, so we can cross them off our list, and do the same with other irrelevant terms. In this case, I’ve crossed out “New York” since our target website (a random SEO agency) does not operate locally in New York. Now that you have a well filtered list of LSI keywords and other relevant terms, it’s time you start incorporating them into your content. 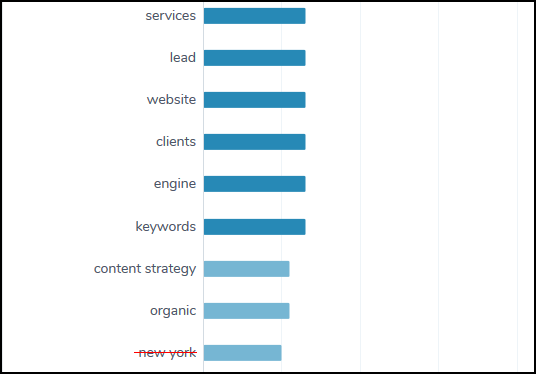 When it comes to keyword density in SEO, the ideal parameters for main keywords and LSI have been well stablished along the years, my suggestion would be to have your main keyword’s density at healthy percentages (1.2-1.5%), but also to modify your content to include terms in this list. These terms, in many cases, can count as LSI keywords, and as such shouldn’t follow strict percentages. You should just use them where they make sense. Modifying your content to better accommodate these terms is a priority, even if it means changing your webpage’s overall structure! Terms with a considerable weight might even earn their own subheading, depending on how scarce they’re currently used. You might find yourself in a position where you’ll notice your content is becoming exceedingly long. In this case, I recommend you use navigational resources, like a content index or menu at the start of your articles and clear headlines. I also recommend you create additional multimedia resources, they can be video embeds, images and even call to actions that prompt your prospects to take action. Keyword density in SEO is important, just as it has been in previous years, but your onpage optimization efforts to guarantee positive user experience and high engagement is equally important. It’s also highly recommended you track how these changes perform over time, as part of a conversion rate optimization campaign. Content relaunch strategies are going to be huge, if you buy pbn links after you’ve optimized your keyword density in SEO with a TF-IDF optimization tool, will significantly improve your chances of climbing the SERP positions. Backlinks will still remain important, but feeding your freshly updated and optimized content with powerful, topical relevant links is a tried and true method to better rankings and conversions. In order to make sure your content is fully optimized, we need to take a look at Ryte’s graphs. You’ll notice a bunch of orange bars: these bars represent each of the keyword’s weight in relation to this query. The taller the bar, the more relevant it is. The “Detail Mode” section has similar data on what your keyword density in SEO metrics should be. Chances are you’ll notice right off the bat that you’re not using all the recommended terms. Now it’s up to you to find a way to include them in your content, without turning it into an unreadable, keyword stuffed nightmare. The recommendations I typed out earlier are equally applicable, but if you’re struggling for ideas, I suggest you visit your competitor’s website and see what they did. Remember, as long as it’s informative and presented in a creative, readable way, there’s a very good chance your reader will enjoy the content you’ve added. After that, it’s a matter of waiting, and carefully tracking your content’s metric with Google Search Console, or with your Google Analytics dashboard. If you haven’t set these up, I highly recommend you check out the articles we’ve published on these topics! While Ryte offers some free accounts with limited features, it’s still technically a premium tool. WebSite Auditor, on the other hand, is free to use, but won’t allow you to save your research or projects unless you purchase a premium package. Having said that, it’s still a remarkably accurate tool, and if you’re strapped for cash, it’s an excellent choice. WebSite Auditor TF-IDF analysis will break down phrases and single words, tell you how many times your competitors have used each term in their content, and whether or not you should add specific terms to your content. It’s a very accurate tool for measuring keyword density in SEO as well, and figured it deserved at the very least, a quick shout out. Anyways, you’ll want to choose one of your published content, then click “Content Analysis”, and then click “TF-IDF” finally, enter your target keyword. WebSite auditor will automatically scrape your top 10 competitors, and come up with a complete list of each phrases and words they’ve used, how many times they’ve been used and even calculate an average for each of these keywords. 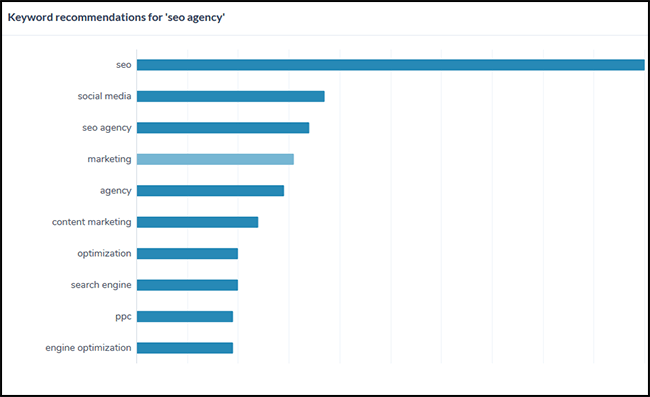 It’ll compare all this data with the webpage you’ve selected and populate a graph so you can easily visualize relevant terms, and whether or not your SEO keyword density is on point. The optimization process is exactly the same: incorporate terms as you see fit but do so in a way that makes sense to your users and make sure you include sufficient multimedia resources. This year is shaping up to be a year full of opportunity in SEO: keyword density in SEO is already seeing some major shifts with the TF-IDF formula quickly gaining popularity, and Google’s decision to focus on authority and quality content represent a unique set of challenges that will no doubt cause major ranking changes in the following months. I think TF-IDF optimized content will become part of a content relaunch strategy, that coupled with a few PBN backlinks, could earn companies and marketers some serious revenue as long as they carefully track how their revamped content behaves on their analytics dashboards. That’s all for now, thank you for reading, if you have any other questions about the TF-IDF formula, feel free to comment below.